Disney's Star Wars: The Last Jedi has a ton of twists and surprises, which is a welcome change of pace from The Force Awakens. Some of the bigger reveals were welcome to all Star Wars fans, while a certain faction can't agree with any of the choices Rian Johnson made in the sequel. However, The Last Jedi is still earning big bucks at the box office, and has now broken into the top 20 highest grossing movies of all time, moving past the Harry Potter franchise as well as passing up Rogue One in less than a month in theaters. One particular surprise cameo was leaked ahead of the release, but it still came as a shock. Now, Neal Scanlan is revealing just how they brought the special character back for more screen time. There are SPOILERS ahead for The Last Jedi, so read at your own risk. Neal Scanlan, head of the creature shop on The Last Jedi, sat down with Nerdist to talk about how they brought a lot of the practical effects and puppets together for the movie. This time around, Scanlan talked about bringing a practical Master Yoda back into the Star Wars universe instead of relying on CGI, like George Lucas did in the prequels. Rian Johnson and Neal Scanlan knew that they had to use a puppet for Yoda like they did in The Empire Strikes Back and Return of the Jedi to get back to the practical creativity that made Yoda so special to begin with. When it comes down to it, Frank Oz had to come back and get underneath the floor to puppeteer Yoda, just like he did during the original trilogy. Once Neal Scanlan found out that they got Oz back to puppet the character, he became excited and started to think back and study how they made Yoda in the first place. He explains. "To know that we were going to have Yoda, we just said, 'Look we need to go back and look at Empire Strikes Back, we need to look at how Stuart [Freeborn] created Yoda because that is the most pure puppet moment. It's Frank Oz, who is one of the greatest puppeteers ever, and we knew that Frank was going to redo this. We just felt that it was absolutely right and proper that we create the puppet in the closest likeness to the original and to give Frank exactly what he had the first time around. We were acting it out in a very similar capacity of Frank being beneath the floor, and the puppet being above him and his assistant puppeteers with him to do the eyes and the ears and the extra hand and his little feet all on rods." 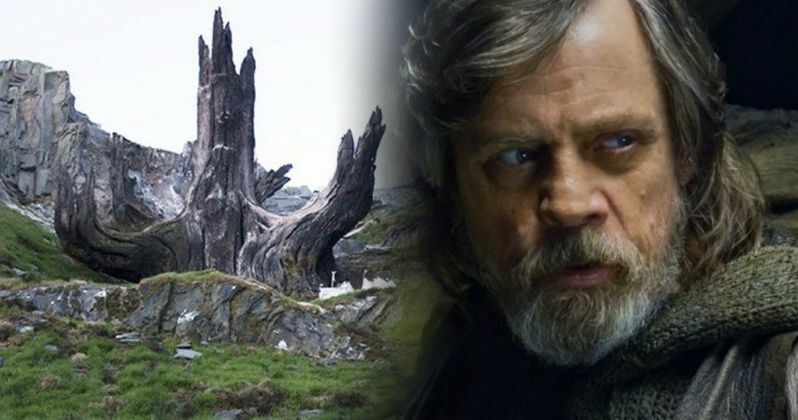 Much like a lot of The Last Jedi, Neal Scanlan and director Rian Johnson spent time studying the original trilogy to get the look and feel transported into the new movie. Seeing Yoda back as a practical puppet is one of the best parts about the entire movie. While everything started to fall into place with Master Yoda on the practical end of things, one aspect of the story had Neal Scanlan worried, which was the fact that the Jedi Master is a Force Ghost. The problem was simple: if there's too much CGI to make Yoda look ghost-like, it'll ruin all of the practical work that Scanlan and the crew had taken such effort to recreate. So, Neal Scanlan recalls having to have a discussion with Rian Johnson about not going overboard with the use of CGI. He had this to say. "I remember saying to Rian [Johnson] that if we were going to do it, we couldn't make him too much of a ghost because it would deny everybody the joy of seeing him solid and real. The guys then came in later and added a really lovely glow, which I think just reminds us of the fact that Yoda is there as a ghost, but is there enough for you to really feel that you're not being cheated." All of the hard work and effort paid off because Master Yoda looks amazing in The Last Jedi. Frank Oz knocked it out of the park as did Neal Scanlan and the rest of the creature studio to bring the Jedi Master back to life, so to speak. Yoda brings back some of his trademark humor and he looks natural sitting next to Luke Skywalker on Ahch-To. You can read more about what Neal Scanlan had to say about bringing Yoda back via Nerdist.